Trying to get the perfect picture wherever life takes you means one thing. You're moving around. That puts your camera at risk, especially the lens, the most valuable part of your investment. Protect your lens with Lens Defender! Lens Defender is a 'better mousetrap' of the traditional camera lens cover. 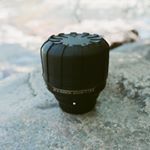 Whether you are hiking the Himalayas, riding the bullet trains in China or walking high tide in the surf, you can do it with confidence knowing your Lens Defender lens cap will never fall off and will keep your camera lens safely covered from all elements. STRONG SILICON - Made from next generation silicon material, nothing can breach Lens Defender. It is shock-absorbent and can take a light bumping or banging. It also seals your lens in a protective case that doesn't let dust, rain, dirt, water, sand or any elements through. FITS ALL BRAND and OEM LENSES - Lens Defender Universal Lens Cap fits any lens with a barrel diameter between 60mm and 150mm. This means 99.9998% of all DSLR and FULL-FRAME MIRRORLESS Camera Lenses can be protected. EASY TO USE - Lens Defender is easy to put on and take off. Simply use two hands to slide the cover on and only one hand to quickly remove it. And it can be easily compressed to fit in your pocket, bag, knapsack, or underneath your armpit when you are shooting. STAYS LOCKED ON - Only by purposely pulling Lens Defender off will it actually come off! Unlike regular plastic lens caps it fits securely and doesn't slide around. TRAVEL WITH CONFIDENCE - When you are on planes, trains, and in automobiles, going through airport security and hopping in and out of taxies you will not have to worry about knocking your camera around. It's covered with Lens Defender! Don't take chances with your investment. Lens Defender will be the last lens cap you ever need!